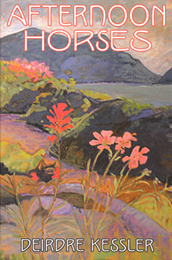 Cover of Afternoon Horses is by Cecily Donnelly (cecily@donnelly-design.com), a detail of one of her series of paintings, Fireweed Trail. Deirdre Kessler's Afternoon Horses is rich with facts--the daily affections of family life, childhood experienced and observed, the magical presence of birds and plants. It also pays its homage to the bright images and shapely tales collected in travel. It goes abroad, but it also follows the vital rhythms of language inward. Then her lean, taut lines offer lessons in how to take flight while standing perfectly still. Here is a poetry of quiet power, a poetry of deep, all-gathering compassion, a poetry that reaches out in love to all that swims and swarms upon the face of the earth. "I cast out", writes Deirdre Kessler, "and this moment, somewhere, you are safe." But this is, too, a poetry of the intimate, local moment -- and specifically of the local ground of two islands, islands as distant from each other as it is possible to be on the beautiful blue planet. Kessler's is a poetry that binds the immediate here to the immediate there, and it does so with a deployment of imagery that is so deft, so perfect, that it stops the reader in her tracks, demanding engagement with big moments, small moments, "each a slow breath of a world". It is a singular achievement. Deirdre Kessler's poems speak vividly, gently, and passionately to those who are nourished, or in need of replenishment, by the natural world. She writes with both the precise eyes of a Darwin and the treasuring eyes of an Audubon or Georgia O'Keeffe. Her poetry knows coyotes and bees, eucalypts and mountain pines, desert light and ocean storm, with the authority and humility of one who has paid deep attention. Even more, Kessler's landscapes, whether in Oregon and the American southwest, Tasmania, or Prince Edward Island, are vibrantly inhabited by the presence and traces of ancestors -- aboriginal peoples, pioneers, myth-makers -- and of the settlers and wayfarers of our own time, those who preserve and honour, and those who devour and destroy. 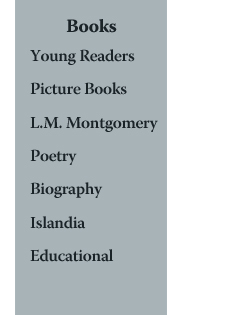 Kessler's poems also know childhood and family: sibling love and worry, parents' bittersweet gifts to their children, the sinews that hold families together through distance, aging, and death. From her childhood homes in America, to her habitation in P.E.I., Kessler enfolds us in her sense of wonder -- for friendship, for history, for the endless revelations of nature. Fierceness and sadness also appear, when a desert is sown with land mines, when we slaughter other species. Yet, "so much of life surprises" with beauty, and our "hands find the right places / in dark rooms or under stars in middle of nowhere." These are poems that find the right places, that surprise us with us joy.